tigger19687 wrote: I was not aware that the wipers would stop 1/2 way up and then not go down with pre-heat, TY. This is the 1st car I have with preheat thing. The wipers don't automatically move with pre-heat. What I was saying was that if your HVAC was set to blow air on the windshield but failed to defrost the wipers, that you could manually move the wipers up so that they were on a heated part of the windshield. I don't know how effective the defroster is yet at thawing the windshield wipers as we haven't had real snow or freezing rain yet (had some flurries, but it was dry snow). I don't foresee any issues as the i-MiEV does a good job at thawing the blades. Sorry for the confusing ramble. I noticed something interesting this morning. Outside temperature is hovering in the high 20's low 30's and the car hasn't moved since Friday. This morning, I went out to the car and powered it up. While I was sitting in it, I noticed the power draw moved up from 1 kW to 2 kW. Looking at the energy screens, the battery conditioning segment started growing. The car was heating the battery . Not much, just enough to get it above freezing (heater only drawing about 1 kW). GM's thermal management appears to be much more aggressive than Mitsubishi. But on the flip side, I'm not sure how I feel about battery power being used to heat the battery. I'll have to see if it does it again and if it does it while driving. It took several minutes of being on and not moving for it to start heating. Since seeing this behavior, I've been able to verify what the three coolant tanks are for. Left-hand side tank is for electronics/motor, front passenger (right-hand) side tank is the battery, and the rear passenger side tank (tucked under the plastic trim between the hood and wiper blades) is the HVAC heater loop. I too noticed the draw at 2kW but there was nothing on, no heat no nothing. It too was cold out. So it must be to warm batteries. Not much of a draw but maybe worth it to keep plugged in over night ? I didn't drive our Bolt EV that day. My son did, and he didn't mention any issues. When I have used the defroster, it works as expected. Something tells me the Bolt won't be a good winter car. Likewise, pre-heated for 15-20 minutes with air on the windshield, but the wipers remained frozen to the windshield. Got them free, then had issues getting them to park correctly. 1/3 of my heater power went to the battery this morning, but seemed to only run while I had cabin heat enabled while driving, so it appears that we do have some control of battery thermal management. It was only 28 degrees this morning, too. What's going to happen when it drops into single digits? So, now that temperatures are in the single digits, I'm finding that battery heater power has increased, but not significantly. The bigger issue is that the wipers permanently have ice blocking them in (more of it has evaporated than has been defrosted by cabin heat). This morning, it was a balmy 0 F. Preheating worked like a champ, but I found that I can't move the windshield wipers by hand like I could before. They are stiff in the servos. I don't know yet if this affects normal operation. I wonder how much cold weather testing GM did. I know the Bolt was rushed, but they nailed everything down pretty well except for the wipers. There's nothing to thaw the trough out. So far, this is pretty similar to our e-Golf and LEAF. Since EV's don't have excess heat, we tend to not run the defroster when we don't have to, obviously. The LEAF has a deeper trough, and the e-Golf has a more closed trough. 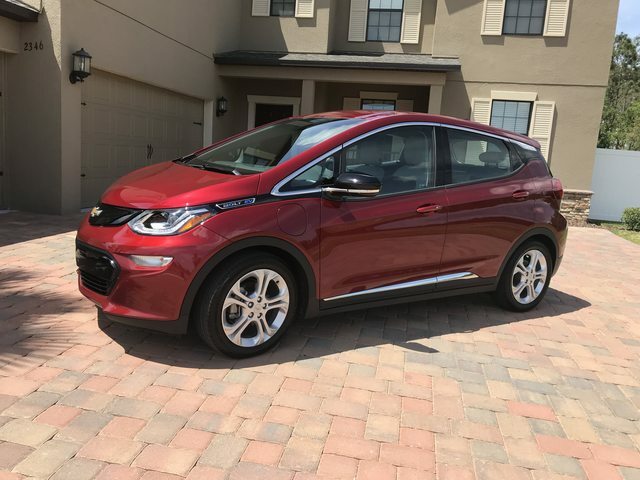 What we like about our Chevy Bolt so far, besides the 238 mile EPA range, is how much fun it is to drive with one-pedal driving and 266 lb⋅ft of torque. It's very comfortable, roomy, and has a touch screen Infotainment center with Apple CarPlay. Ah, that Cajun red . That's the color I wanted originally, but couldn't get my hands on. I still like my orange, though. It's different. Although, I think my Bolt's cursed. Been driving i-MiEVs for 5 1/2 years now with hardly any issues. I've had the Bolt 13 months and have had 2 flat tires, one requiring a tow. So, more on this second flat. Driving home from work a couple weeks ago, I just crossed railroad tracks on a corner and as I was straightening out and accelerating, I glanced down at the speedometer to check my speed (try to drive by feel, but occasionally check myself). I looked back up and just caught a glimpse of something dark in front of the car as it disappeared beneath the front end. Before I could react, I hit the object, a 6" X 6" X 12" block of wood . I hit the end of it with the inside edge and center of the left front wheel, immediately splitting the wheel nearly in two. Due to the weight of the car and the stiffness of the suspension, the car didn't jump or veer; the wheel ended up absorbing most of the energy of the impact. I quickly slowed down and pulled off the side of the road, not knowing what I'd find. I fully expected to see the fender all torn up from the tire. I got out of the car, and found a flat tire with a split wheel, no apparent damage to the car. Since there's no spare, I called my Dad to see if he could bring a wheel off of the C-Max. Of course, the bolt pattern is 2 mm larger, so that wouldn't fit. We ended up towing the Bolt back to my work, as it was a lot closer than home (rollback). Calling around to different dealers, the price of one factory wheel ranged from $395 to $800. I ended up buying a full set of aftermarket wheels for $700, which gives me a full spare and two winter rims from the remaining 3 OEM wheels. I got the new wheels put on with 2 new tires (replaced both fronts as they were worn). However, the impact knocked the front wheels out of line, so I got it lined up. For now, the Bolt is back on the road. The only remaining thing to figure out is there is now a mild rumble from the front end. I figured that it may be a wheel bearing.